Step 1 Soak 10 wooden skewers in water for about 1 hour; remove from the water when you are ready to begin. Lightly oil the grates of a gas grill and preheat it to medium high for about 20 minutes. Step 3 In a food processor, chop the onion, garlic, and parsley. Step 4 Add the beef, lamb, bread (be sure to squeeze out the water completely), and the spices. Run the processor until all is well combined forming a pasty meat mixture. Step 5 Remove the meat mixture from the food processor and place in a large bowl. Take a fistful portion of the meat mixture and mold it on a wooden skewer. Repeat the process until you have run out of meat. For best results, make sure each kofta kebab is about 1 inch in thickness. Step 7 Place the kofta kebabs on the lightly oiled, heated gas grill. Grill on medium-high heat for 4 minutes on one side, turn over and grill for another 3-4 minutes. 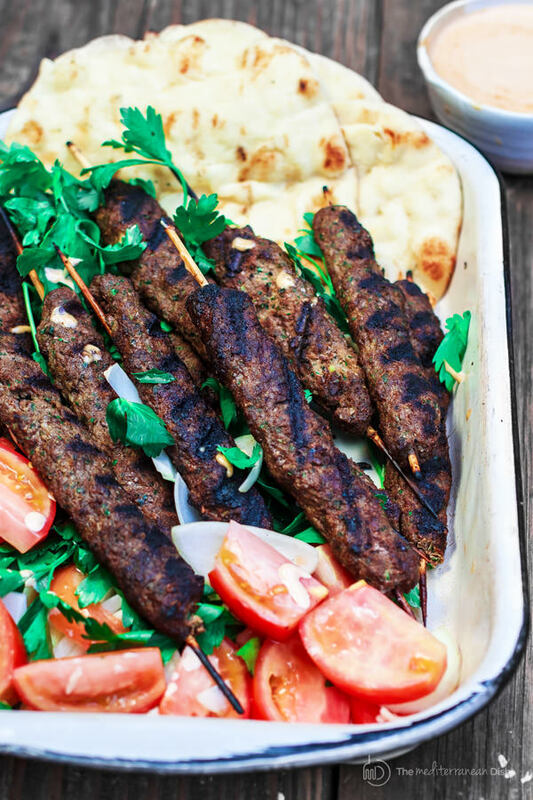 Step 8 Serve the kofta kebabs immediately with pita bread, tahini and the fixings you prepared. See suggestions for sides and related recipes. A must-try authentic Kofta kebab recipe: ground beef and lamb mixed with fresh parsley, onions, garlic and Middle Eastern spices! Grilled to perfection. Be sure to see the video and the step-by-step photos.